We’d love your help. Let us know what’s wrong with this preview of Social Beings by Susan T. Fiske. Offering a refreshingly new approach, while maintaining the standard chapter topics of traditional social psychology texts, Susan Fiske's SOCIAL BEINGS conveys the excitement and vitality of this fascinating field, and captures students' imaginations by connecting the material to their everyday lives. Fiske provides a highly readable and engaging narrative flow based on th Offering a refreshingly new approach, while maintaining the standard chapter topics of traditional social psychology texts, Susan Fiske's SOCIAL BEINGS conveys the excitement and vitality of this fascinating field, and captures students' imaginations by connecting the material to their everyday lives. To ask other readers questions about Social Beings, please sign up. Some interesting material, but full of overgeneralizations, faulty reasoning, poor methodology, and shaky concept formation. These topics carry weight, but they are dealt with in a very unrefined manner. This book, in combination with my "Advanced Social Psychology Seminar," have cause me to seriously doubt much of the work done in social psychology. Here are some examples of the kind of problematic reasoning that is representative of the material I have read this semester. A pub Some interesting material, but full of overgeneralizations, faulty reasoning, poor methodology, and shaky concept formation. These topics carry weight, but they are dealt with in a very unrefined manner. 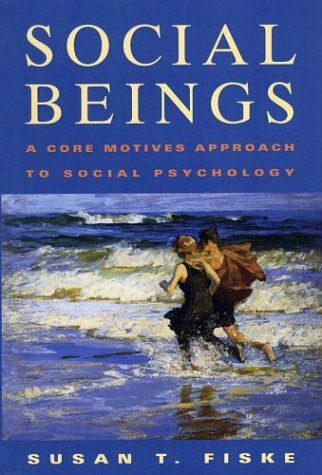 This book, in combination with my "Advanced Social Psychology Seminar," have cause me to seriously doubt much of the work done in social psychology. A published social psychology researcher recently said (roughly), "Those who sexually abuse children roughly fall into one of three categories: those who abused children while drunk or high, those who are psychopaths, and those who sexually abuse children because they are sexually aroused by children. 95% of those who sexually abuse children fit into the last category." So then the idea is that if a person sexually abuses a child, there is a good chance that this person is sexually aroused by children. No surprises there. The researcher went on to say that in his work they would expose subjects to some material involving children (not sure exactly what this was) while testing the subjects' physiological response. That is, they would test to see if subjects were sexually aroused by children. Citing the above empirical information, the researcher said, "So if these individuals were sexually aroused by children, we know that if they have not already sexually abused children, it is highly likely that they will in the future." To recap, the researcher cited evidence suggesting that if a person sexually abuses a child, there is a good chance that this person is sexually aroused by children (A-->B). The researcher would then attempt to verify that a person was sexually aroused by children (B), thereby concluding that this person has or will sexually abuse children (A). Throughout this study, the authors assume that the emotional effects brought about through ostracism are entirely social or other-referential. That is, the authors assume that a person’s negative reaction to ostracism is entirely (and directly) due to becoming an outcast of sorts. Yet, it might be suggested that persons have a relatively automatic, self-referential reaction to ostracism. Individuals are no doubt use to associating ostracism with a perceived failure of some sort, even if that perception is not truly warranted. That is, a person usually becomes an outcast because their performance (whether social, physical, etc.) is counter to the goals or desires of a specific group. Thus, even if the ultimate explanation for negative affect resulting from ostracism is socially oriented, the immediate explanation might be more accurately cast in self-referential terms. Instead of automatically thinking “Bummer that I have become an outcast,” it might be suggested that a person automatically thinks “Bummer that I failed.” This approach would perhaps better explain the fact that ostracism by computers brought about just as much, if not more, negative affect than did ostracism by humans—for computers are often seen as objective judges of ability. If a person is ostracized by another person, the former can always claim injustice, but if a person is ostracized by a computer, that person cannot possibly claim that the computer is acting unjustly (the only thing that the person could claim is that the computer was programmed unjustly by another person). very thorough textbook, thoughts were explained in very understandable manner.